when this product will be back in stock. The long dress with train in bridal style are made of fine flowing micro satin in a delicate cream color near white. The material is very soft and dense and is the crease-resistant and easy to iron. There is bead embroidery on the neckline and waistband. The embroidery is a modern flat pattern made from a mixture of beads of different shapes, sizes and colors - white, creamy, frosted white, silver and gold. The dress is completed by a long veil on the decorative hairclip of the same pattern as dress embroidery. The veil is of complementary color, pale pink, and is easy removable. The waistband is exactly tight on 14cm waist circumference. The fastening is on the back with hooks. All inner seams are flat or hidden. Enjoy nice contact and look during wearing of the dress. This is product of high-quality work out and the artistic value. 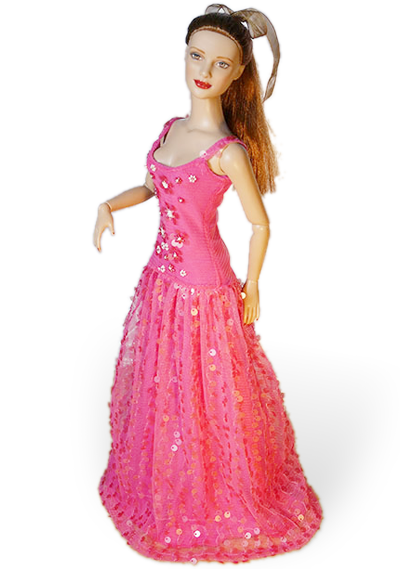 The line of dress is exactly fit for 16inch fashion doll as Ellowyne/Prudence/Lizette of Tonner. Only the dress and veil on hairclip are included. The doll is not included! The embroidered dress involved special care, I'll put a printed leaflet with short description and care about into the pack. Be the first to comment this article. Comments can be added only by the logged-in user.